What does fall mean to you? Maybe it means caramel apples, pumpkins, hot chocolate, and sweaters. However for us, at Big Bear Adventures, it means the great outdoors. The leaves are melting from green to burnt orange and fiery red. The leaves fall over head creating a rain of color. The crisp air kisses our skin as we raft down the river. Fall is the best time to go rafting and to explore the great outdoors in Indian River MI. There is no better way to see the changing colors of fall than to submerge yourselves in the middle of it and go rafting. The trees create a canopy overhead, and the water will guide you down the river as you are gazing at the trees. The Sturgeon River is the fastest river in Michigan’s Lower Peninsula! Not quite whitewater rafting, but exciting and challenging with its swift and often tricky current, along with leaning trees, stumps, and logs. The current does most of the work so that you can take in the autumn air and colors but it is up to you to guide your watercraft down the crystal-clear river as it winds its way mostly through the beautiful state forest. When preparing for a fall rafting trip, come prepared for the chilly weather. Dress warm and expect to get wet. The rafts are hard to tip so you do not have to worry about getting dunked in the river, but there might be a splash or two along the route. The wind will be a little heavier and chilly on the river so bring a stocking cap or gloves if you tend to get cold fast. All River Trips end at Burt Lake State Park, where you turn in your equipment and have a chance to explore the park and the fall foliage. Burt Lake State Park offers over 2,000 feet of beach, a picnic pavilion, grills, playground, a beach volleyball court, horseshoes, and a 1-mile wooded hiking trail. Take a hike at the park and along the way take pictures and collect leaves. Gather leaves that are unique in color and shape. Keep them as a memento and when you get back from your rafting adventure press them into a journal. The leaves will dry and leave an imprint. You can even keep the leaves in your journal and attach your pictures on top to make a scrapbook of your memories at Big Bear Adventures. Your Northern Michigan Autumn Adventure Starts at Big Bear Adventures. Enjoy the colors while rafting or maybe get closer to the trees on the ropes course. 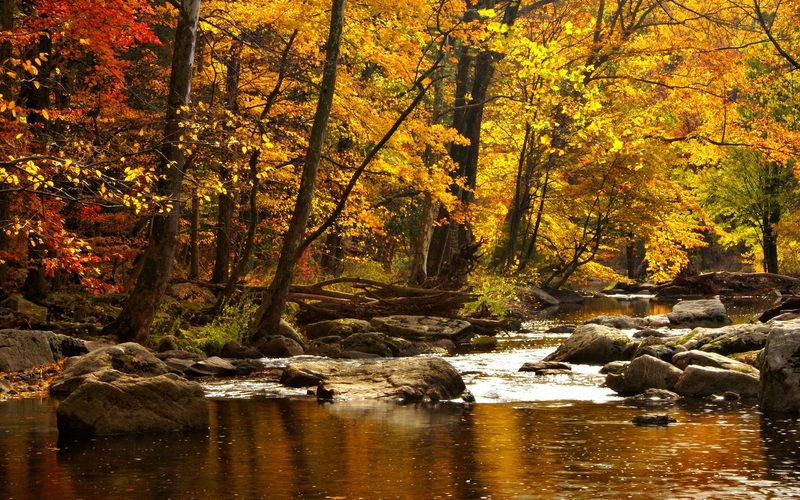 Whatever you decide to do, Big Bear Adventures is the perfect place to experience fall in Indian River MI. Grab your sweater and join us for a fall adventure!